The U.S. women's national team and U.S. Soccer remain engaged in talks over a new collective bargaining agreement, and after one meeting with the new player reps and legal representation, the tone of those talks has changed, federation president Sunil Gulati said in a wide-ranging interview with SI's Grant Wahl on the Planet Futbol Podcast. The U.S. women's player's association moved on from Rich Nichols, who had been representing the players and their interests of securing equal pay to that of the U.S. men, hiring the firm of Bredhoff & Kaiser and naming Becca Roux the interim executive director. The three players at the forefront of the discussions are now Becky Sauerbrunn, Christen Press and Meghan Klingenberg. With the equal pay discussion being a complex one given a number of factors that differ on the men's and women's side, Gulati says that what he is hoping to achieve is an “equitable agreement,” one that is fair for both sides based on those variables. Elsewhere on the women's soccer front, the NWSL just signed a three-year broadcast TV deal with A+E Networks and Lifetime (with A+E Networks purchasing a stake in the league), which will increase the exposure on the growing league. 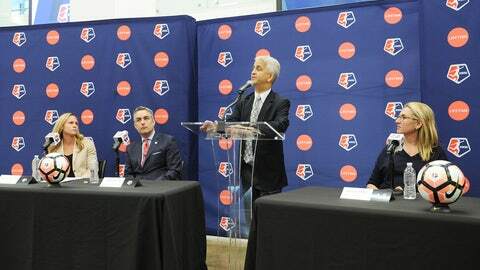 Gulati sees this as a difference maker in terms of getting the league more commercial viability and greater exposure than the handful of games that have been televised in the past few seasons. Listen to the full interview with Gulati in the podcast above and subscribe to Wahl's weekly interviews via iTunes here.